An analyst claims that Apple is on track for its services business revenue estimates so far, and any large acquisitions it may make will just accelerate the growth driven by the iPhone 7, and successor "iPhone 7s" and "iPhone 8" devices expected in 2017. 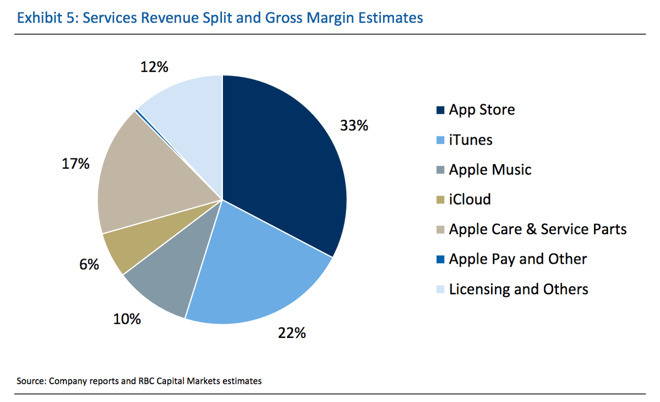 Amit Daryanani of RBC Capital Markets writes in a note to investors provided to AppleInsider that in order to hit Apple's services projections, the company would have to grow revenues from the division by 18 percent over the next four years. On the average, Apple has grown services by 21 percent per year, over the last five years. Daryanani estimates that the largest contributors to the Services division are the App Stores, iTunes and Apple Music, AppleCare and Apple Upgrade Program, Licensing, and the Genius Bar, in order. Customer loyalty to the brand, and the synergistic benefits that Apple's services provide for users reportedly contribute to Apple's services revenues more than other companies' offering to their users. The growth numbers may be impacted positively by the so-called "super cycle" that appears to be approaching with the "iPhone 7s" and "iPhone 8" release, as well as any large acquisitions. Other factors cited in the report are a quick Mac or iPad refresh cycle, or an "iTV launch" — which is not elaborated upon in the investor's note, but is presumably the oft-rumored "over-the-top" cord-cutter's video streaming service. Revenues are expected to remain high, as most of the gross margins exceed that of the hardware that utilizes the services. The App Store is estimated to be 85 percent gross margin, with Apple Pay delivering 80 percent, iCloud margin hitting 75 percent, and AppleCare and service parts around 70 percent. 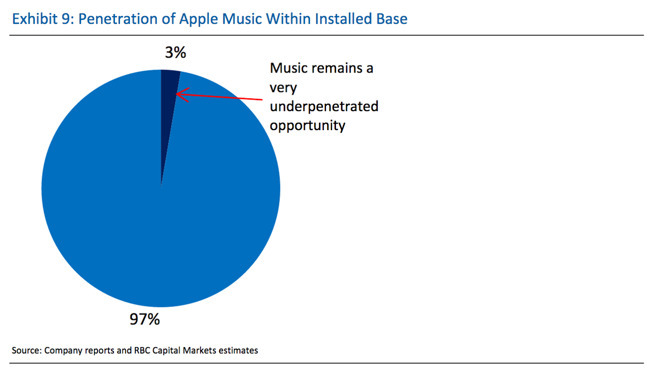 Daryanani calls Apple Music's sector "very unpenetrated" in relation to the installed user base, and a "very attractive opportunity" for user growth. On the strength of services and the upcoming "super cycle," RBC Capital Markets is increasing its Apple stock price target to $155, and is expecting year-over-year revenue growth for the foreseeable future. Most of the potential risks to the increase could be considered self-inflicted, with Daryanani listing "execution stumbles," "greater-than-expected iPod cannibalization," and "channel conflicts or execution" as theoretical problems that could impact the estimates. During Apple's July 2016's earnings conference call, CEO Tim Cook said that Apple's Services business is expected to be the size of a Fortune 100 company at some point in 2017. In January, Services earned Apple $7.17 billion, 13 percent higher than the previous quarter, with the division posting the largest gain on a percentage basis of all of Apple's business segments.